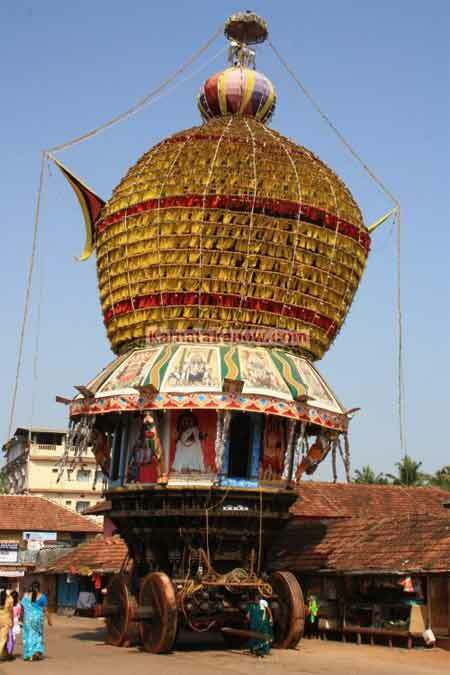 The annual Makar Sankranti Festival observed in the Udupi Sri Krishna Temple is known as Sapthotsva. The seven-day festival usually begins on January 9 and the most important date is January 15. The final day sees three beautifully decorated chariots pulled around the streets. The festival commemorates the establishment of the Bhagvan Sri Krishna Murti at the Udupi Sri Krishna Temple by Saint Madhvacharya around 800 years ago. The utsava murtis in the Udupi Sri Krishna Temple are brought to the Madhwa Sarovara (sacred pond on the premises of the temple) in a golden palanquin at around 7.30 PM on Makar Sankranti day. The murtis are then kept on a decorated boat and taken thrice around the sacred pond. After the boat ride, the murtis are taken to the front of the Sri Krishna Temple. The murtis are then taken around on chariots. The utsava murtis of Anantheshwara and Chandramouleshwara are placed on the Mahapuja Ratha. Thousands of devotees pull the chariots on the day. After the chariot seva, the murti are taken to the Vasant Mahal for puja. The widespread belief is that those having darshan of the murtis will get redemption from sins.